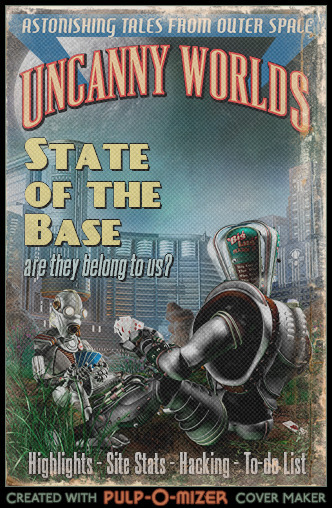 What has happened at the Base in 2012? A lot of things! I hope we can beat that in 2013! I’ll add a few bucks to make the first prize even better. Sponsors are Welcome! Well the base wasn’t really hacked. It was vandalized by a script-kiddie. Nothing was lost, and I didn’t lose control over anything. A script found a vulnerability and vandalized what it could. I could restore everything. This made me upgrade to the latest version of WordPress (the software that is running the blog). I also added two plugins that I thought looked cool. A dice roller and a forum. Now I am a lot more restrictive about the plugins I add. I am looking forward to 2013. On my to-do list there are a few reviews that needs to be written. I will also write something about spherical ships. When I have time I will also do a few updates of some old stuff. I will continue posting news about the Zhodani Base, Traveller and astronomy at Facebook.